I have waited a long time for an indie author who rivals traditional authors and now I’ve found one. This is a brilliant first historical novel. In common with all good historical authors, this lady knows her subject and this really shines through in the writing, from the phrasing to the background and manners. Cover designers always argue it is the cover that sells the book, as an author I would say it is the content. The cover for this book is stunning and although I thought it was Venice, I was happily surprised. It is nice to see a historical cover which does not just have people in period costume. With a cast that rivals a Dickensian novel, the author has the good sense to include a list of characters at the start, giving their titles and relations to one another. 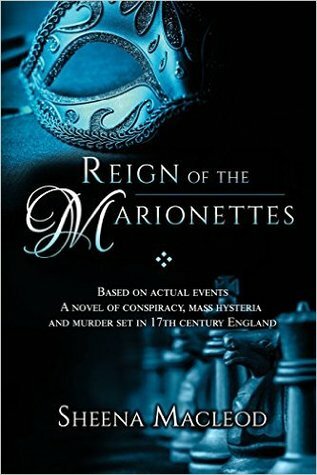 By starting with a short prologue set in 1556 in the reign of Mary Tudor the author sets the scene for what is to come. Mary blames her father Henry VIII and Anne Boleyn for bringing division to the church and the country, something that will continue under Charles II in whose reign the story is based. Chapter One starts with the arrival of Mary Beatrice, a 15-year-old Italian, Catholic princess, who is to be the wife of James of York, Charles’s brother and heir to the throne. Charles had married the Catholic Princess Catherine of Portugal 11 years earlier. Both Catholic brides are the focal point for anticatholic sentiment, but Charles is viewed as a Protestant monarch, James is not. We see Mary Elizabeth’s vulnerability when she comes to court and Elizabeth, Countess of Powis, one of the central characters, befriends her. It is through her eyes, as wife and mother, not just a royal courtier, that we see the commitment and suffering of the Catholic faith. Political intrigue is at the heart of this book with no one more embroiled in its sordid machinations than Titus Oates. Not so much a bumbling Mr. Collins as an odious Uriah Heep. Plagued by insecurity he seeks his father’s approval and respect, but when he does not get it, he resorts to abusing his father’s congregation. Cast out by his family he vacillates between poverty and promise. Obtaining a position on the ship as a Protestant chaplain, he is dismissed as lazy and not performing his job properly. He obtains a similar position at a noble’s house but loses this employment for the same reason. When introduced to the Jesuits Titus willingly professes to convert, only to betray them later as part of a Papist Plot. With increasing paranoia surrounding Catholicism, Titus begins to make a name for himself through his association with Dr. Tonge and his accusations as a revered witness for the prosecution. This becomes the most lucrative and prosperous part of his life, where his perjury sends many Catholic men to the gallows. His wild accusations only fuel his ego, to the point where he feels invincible. The Protestant or Parliamentary cause is best personified by the Earl of Shaftesbury. An old man unsteady on his feet, but still sharp enough not to declare a disliking of Catholics to Elizabeth Powis, but to couch it in terms of Parliamentary consultation. When Buckingham and Shaftesbury learn of a secret treaty with France, to fund Charles’s lifestyle, they see Parliament as being made redundant and with it their republican influence. Shaftsbury’s motivation concerns keeping the king’s position as one of subservience to Parliament. The ending sees the Catholic Lords exonerated and the persecutors punished, but not before many innocent people die at the hands of a less than impartial judiciary. A novel of intrigue, manipulation, and power, reflecting the religious divides of the time, together with the paranoia and fear of either side getting the upper hand. Less Mission Impossible and more Remains of the Day and Amsterdam, anyone who enjoys historical fiction will love this book. As a fan I can’t wait for the next one.